No, this chronic ailment afflicting our citizens has nothing to do with obesity, or diabetes, or heart disease or kidney disease or liver disease. It has nothing to do, in fact, with diseases of any kind, be it of hearts or kidneys or livers, or spleens or bones or lungs. It has nothing to do with how we sleep or eat or exercise or do none of the above. What the latest medical crisis in America has to do with–what researchers and pharmaceutical companies are spending millions to cure–is a devastating condition known as madarosis. Which is, of course, eyelash loss. And it’s ravaging the nation. Our eyelashes are falling out. As a people, as a culture, as a country. And the loss is rocking our moral compass to the core. Most of us are raised with some basic certainties about the human plight: we know we must live, we know we must die. But no one ever told us we could lose our eyelashes in between the two. Why not just give us our first cup of chocolate milk when we’re three and then make us drink plain for the rest of our lives? That’s how disillusioning this madarosis stuff is. One minute you’re batting at the boys like Bambi, the next you look like a confused old woman trying to figure out her new contacts. It’s hard to give that special someone a heavy-lidded look when your eyelids, freed from the fringe, just aren’t that heavy anymore. 2) Last Friday night, when I watched a single hour of tv, that single hour aired a commercial for Latisse at least half a dozen times. Latisse, apparently, is a prescription medication for eyelash growth. I’d never heard of this miracle drug, but by the end of my show I was (am) an expert on all things lashalicious. Discovering it in conjunction with my own recent lash loss can only be chalked up to fate. Because besides playing really pretty music, the commercial claimed that approximately two gazillion people in America are fighting the same battle I am. Watching the ad, I witnessed eyelashless persons become fully lashed in a wink (see what I did there? ), and it gave me hope. I am not alone! There is a cure! Let the lashes fall where they may. But there’s a teensy problem. Though Latisse promises to grow your lashes in darker and fuller (the way I look after a good vacay), I have to get a prescription from a doctor to get my hands on it. Which means I have to a) make an appointment with a doctor, b) show up to an appointment with a doctor, and c) weigh in when I get there. Let’s talk about this. Why, for the love, do they make us weigh in? I’ve seen doctors for skin conditions, eye conditions, scalp conditions, nostril conditions, and every time, the nurse begins with “just need to get your weight real quick.” Can anyone tell me what my weight has to do with my nostril condition? Nada, that’s what. And I doubt it will have any bearing on my eyelash condition either but no matter—my weight will be required, you just watch. I’m convinced its just a power play by the Doc to show us who’s boss right from the start. If he can get us to give up our weight, he can get us to believe him when he says, “There’s nothing I can do for your ingrown nostril hairs; it’s because you’re forty now.” So disgusted am I with this tacit malpractice, I don’t even bother taking my shoes off before I step on the scale anymore. And that’s saying something. So if I’m too lazy busy to see the doctor and get the scrip, only one alternative remains: hire a professional to tack on some falsies each month. This is a hot new trend that, once reserved for beauty and drag queens, is now sweeping the salons of the middle American housewife. I have friends who get their eyelashes “done” and they look fantabulous, but I personally cannot indulge in this practice because of a promise I made to my prepubescent self many moons ago: if I ever have any falsies of any kind implanted anywhere on my bod, you can bet it won’t be on my eyelids. I think you get what I’m saying. 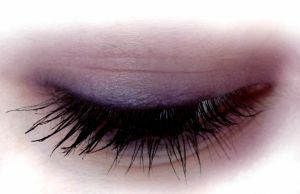 If I ever have falsies of any kind implanted anywhere on my bod, it won’t be on my eyelids. Previous Article Easter is not about far-off, mysterious things. It’s about close-up, homey things.